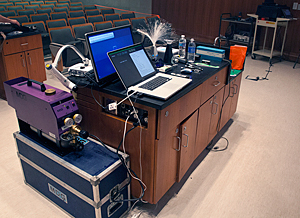 From the venue, the show requires a podium/ table for props and laptop, a video projection system, a wireless over-the-ear mic, and a large screen. The ceiling needs to be a minimum of 10 feet above floor level. Electrical needs are minimal; the lasers are diode systems requiring less than 5A. This photo shows a typical setup. The hazer is to the left of the demo table, which contains the laptop for the slideshow, and various props. There will be haze added to the air to make the laser beams visible. This is mostly un-noticeable to the audience; it appears much like the atmosphere at a “Dancing with the Stars” show. It is very important that the use of haze be cleared with your fire alarm company; we don't want to be setting off any alarms! 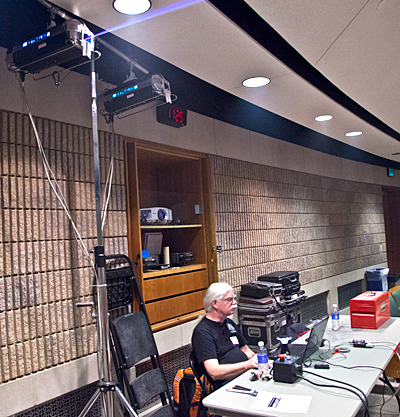 There needs to be a table at the back of the room where our laserist can set up his laptop next to the projectors. 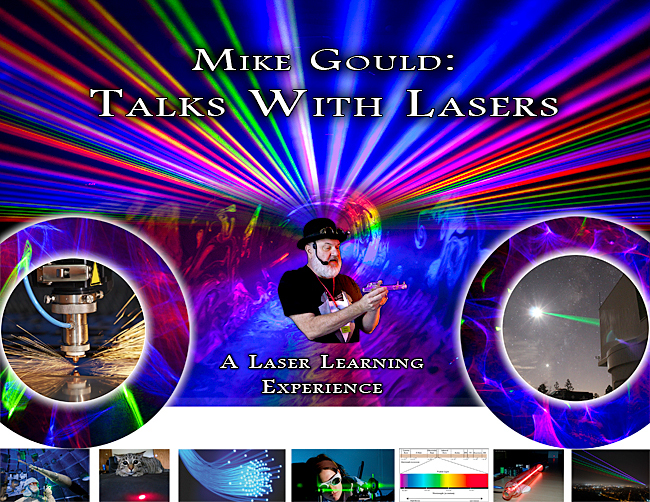 The graphic and beam lasers are custom-built by artist Mike Gould. They contain 2W combinations of red (635nm), green (520nm) and blue (462nm) diode lasers. For safety reasons, the lasers need to be 3M above the floor, and audiences are restricted from being within 2M from the support. There is an additional set of lasers near the screen, manned by the narrator at the lightshow at the end of the presentation. These lasers project something called "Lumia", a beautiful wispy effect. 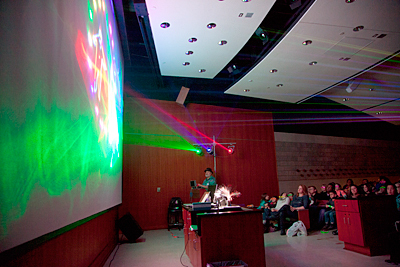 During the concluding lightshow, the two sets of lasers "Jam", providing a complete laser experience. (Please don't print this out; if you want a printable poster, contact us and we will send you a high-res version.) You can add your own copy under the words "Laser Learning Experience".